When you have a wide array of jobs to tackle out in the field, you want a tractor you can rely on for the long haul. 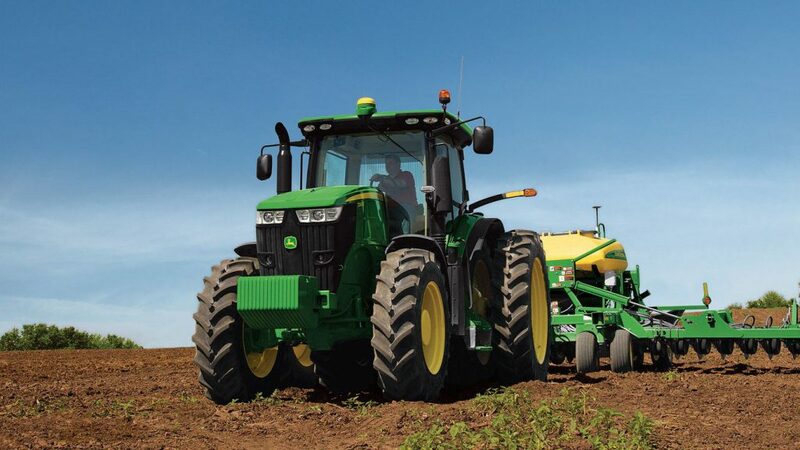 The John Deere 7210R has multiple features that any agricultural professional will appreciate. This tractor comes with a powerful engine, several front hitch options and an e23™ transmission for all of your working needs. Let’s take a look at some of the other highlights of the John Deere 7210R. The 7210R comes with a PowerTech™ PSS 6.8-liter engine with dual turbochargers. It delivers up to 210 horsepower, meaning it can take on even the most rugged, challenging terrain. The John Deere 7210R comes with the Generation 4 CommandCenter, which allows operators to keep an eye on the inner workings of the machine directly from the display. The CommandCenter offers intelligent warnings, context-based help, and custom-defined views. The CommandView III cab provides the utmost visibility to the operator for efficiency and safety on the job. It comes with a ComfortComand™ seat with air suspension, plenty of behind-the-seat storage, and a passive noise reduction system. There are also 12-volt outlets for power, a hitch control lever lock, and a tilt/telescoping steering wheel. With Triple-Link Suspension (TLS™) Plus, the John Deere 7210R has a fully integrated, self-leveling front suspension system. It uses a hydro-pneumatic self-leveling system to ultimately improve productivity and the overall ride. All 7R Series tractors come with an increased front area (IFA) cooling system. It uses a pull-style fan to improve overall cooling efficiency. In addition, it reduces fan noise when a large amount of power is being used, or while heavy loads are being utilized. The John Deere 7210R’s cab lighting pattern provides 330 degrees of illumination, while the remaining 30 degrees comes from the hood lighting. This means that all areas are illuminated efficiently when it’s needed most, providing more uptime and productivity to operators. The e23 transmission of the John Deere 7210R allows for smooth shifting while the tractor is in operation. It is easy to use, and it has the power to handle sudden, high-torque power loads on a whim. It provides improved fluid efficiency and overall productivity. If you have any questions on John Deere 7210R or any of its features, contact your local John Deere dealer.